We've put together a FREE PLR pack with content to help you get up and running quickly in the profitable self-help niche. 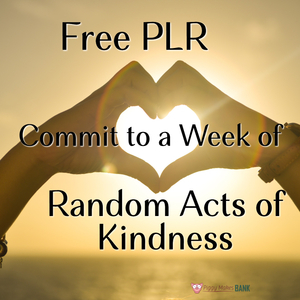 More specifically these articles and emails will help your audience tap into the power of random acts of kindness. Use them on your blog, in your newsletters, or create a new lead magnet with them to grow your list. If you want to help your readers practice mindful kindness you can get this incredibly value-packed bundle for FREE. Simply Register Below and receive an immediate download.